Gubernatorial Ohio Candidate Connie Pillich, standing, speaks before Gallia County Democrats and citizens at Bossard Memorial Library Tuesday afternoon. 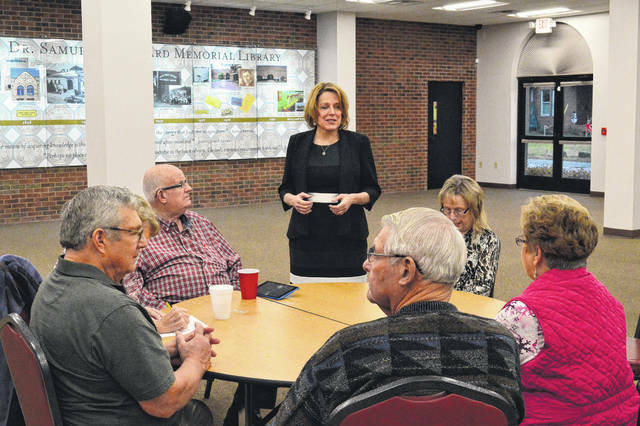 GALLIPOLIS — Ohio Democratic gubernatorial candidate Connie Pillich (D-Montgomery) spoke with Gallia residents Tuesday at the Bossard Memorial Library about the future of Ohio and how she seeks to improve it if she is elected in the 2018 election as Ohio governor. Pillich said the fund would be one of the resources she would utilize for her projects, should she take office. According to Pillich, she believes the education of Ohio has fallen from fifth in the nation to 22nd and is going the wrong way. Part of her proposed education stimulus plan seeks to create universal preschools for four-year-olds and streamline a balanced grade school system with arts and technical education needs met, instead of students being taught just to pass a test. She said she has a plan to make post-secondary education opportunities debt free for Ohioans and would like to institute stronger mentorship programs with schools. She emphasized a strong desire to shut down “charter school scams” while not penalizing those that are seeing student graduation success. To tackle the opioid epidemic, Pillich, again, said a focus in education would lead to greater prevention of opioid addiction. She also wants to increase addiction treatment resources as well as increase state resources given to local law enforcement to stop drug trafficking efforts. https://www.mydailytribune.com/wp-content/uploads/sites/42/2017/12/web1_DSC_0031.jpgGubernatorial Ohio Candidate Connie Pillich, standing, speaks before Gallia County Democrats and citizens at Bossard Memorial Library Tuesday afternoon.